FILE - A farmer inspects beans on a farm on the outskirts of Runge town, some 60 km (37 miles) north of Santiago, Chile, Feb. 3, 2012. After eight years of drought which left fields parched and ski resorts dry, a burst of wet weather, likely triggered by the El Niño phenomenon, has been welcomed in central Chile. August and September in Chile have both seen higher amounts of rain than average for the Southern Hemisphere spring, with capital Santiago's normally blue skies replaced with a grey pall and brown lawns turning a vibrant green. There is growing consensus among global weather forecasters that this year is seeing a strong El Niño, a warming of sea-surface temperatures in the Pacific that can lead to hot, dry weather in Asia and rains in South America. While heavy downpours can trigger destructive flooding, El Niño can also be a positive phenomenon for top copper exporter Chile, bringing relief from usually dry conditions in much of the country. "What is clear is that the central zone responds in a positive manner to a strong El Niño, with more rain in the spring, and that is exactly what has happened," Claudia Villarroel, a national weather service meteorologist, told Reuters. That could give the country's economic growth a boost, as long as it remained a relatively moderate event, analysts at Credicorp said in a report. "In Chile's case, El Niño has normally had a positive connotation, as greater rains and a warmer climate tend to benefit agriculture and energy generation," they said. More snow in the Andes created a "natural reservoir" that was reassuring for farmers, said Juan Carlos Sepulveda, the head of fruit producer industry group Fedefruta. But he warned that if the rains continue beyond November, they may cause blooms on flowering fruit or affect harvests. "In winter, the rain is welcome ... it is coming a little late," he said. 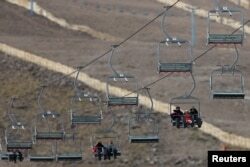 Tourists ride the chairlift at the El Colorado ski center at Los Andes Mountain range, near Santiago, Chile, July 1, 2015. The bumper snowfalls have provided a late-season boon to ski resorts near Santiago, which suffered a delayed start due to scarce precipitation in June and July, but are seen operating well into October. Further north, Chile's tourism sector could also benefit from the "flowering desert" phenomenon, with rains turning the normally arid Atacama into a carpet of colorful flowers - set to attract visitors into November. Weather experts warn, however, the recent rains do not signal the end of Chile's drought. By the end of September, Santiago's total year-to-date rainfall was still some 40 percent below what it should be, Villarroel noted.